You've already seen me try out the black Shredded from Lacquistry when I posted my Shred the Pool manicure. I wanted to use them again, and I was dying to try the gold Shredded over a teal. Then, an idea hit me! I could use them ALL...AT THE SAME TIME! So I did. Listing off the polishes is a bit confusing to say the least, but here's what I used. They're all pretty different looks, but when you pair them all together like this, I think it works. Lacquistry's shredded nail polishes are very cool! I know I love them! You know what else is very cool? Your giveaway! I entered and can't wait for the results! That's a massive giveaway! 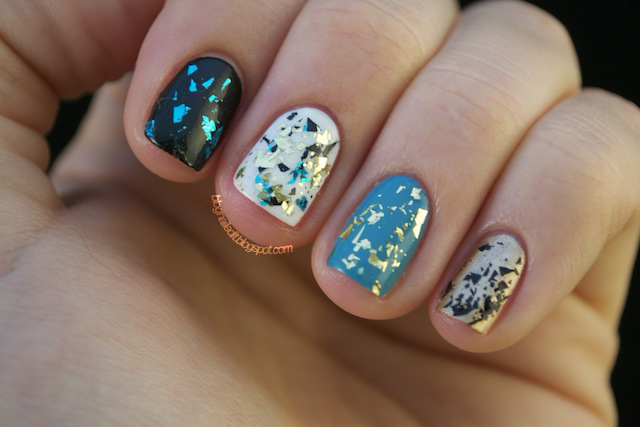 Those are so pretty, I love the white with gold black and aqua shreds! Think I like that shredded stuff-not quite glitter-but more than flakies-may have to check that out! O..MMMGG...i love this look. its a toss up between index and pinky! nice! My favorite is all 3 together! I need to get my hands on some of these.